Melbourne has lost many favourite landmarks over its history, and today I’m going to delve into the story of one of its more wacky architectural icons, the Eltham Barrel. James Lesh will open ‘Melbourne A to Z’ at the letter P for Port Melbourne, and have a chat to Janet Bolitho about what the suburb means to her. 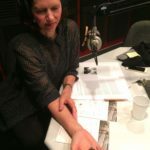 To start us off, here’s Helen Morgan in conversation with Amber Evangelista, curator at the Victoria Police Museum, talking about the centenary of women in policing in Victoria. It’s been a long grind of a week at work, but tonight you can let your hair down, what with the smorgasbord and the hot carvery, Russian Eggs and Hungarian goulash, the happy thrum of hundreds of other guests out on the weekend, beer jugs brimming, the band on stage, the night getting in to full swing. There’s a man — let’s call him Klaus —feet tapping and body starting to sway to the rhythm of the accordion and trumpet, his eyes sparkling at his wife Lynelda as he takes her hand and leads her to the dance floor, a half-jump step to the left, a short half-step to the right, and their polka is underway. Perhaps these Tyrolean sounds call to mind the years before he came, just a baby in Berlin on the cusp of the war, the bombs falling, his mother Lissi growing vegetables to feed the family, pushing all their worldly possessions in a hand cart when the Soviets attacked, then his father Paul, an aircraft mechanic, chancing on an ad in the paper looking for skilled workers for Australia. Paul went on ahead, Lissi and two young boys followed in 1953 on the SS Fairsea out of Bremerhaven, a floating mercy vessel carrying nearly 1500 migrants and displaced souls, over a thousand Germans as well as hundreds of Greeks picked up at Piraeus. A contingent of over 200 got off at Freo destined for the Holden Holding Centre; over 700 were bound for Bonegilla; Lissi and the boys c/o P. Francke, Snowy Mountains Hydro-Electric Authority, Jindabyne Dam, via Cooma, NSW. By 1960 they’d moved down to Melbourne, Klaus met Lynelda at the Altona Squash Club, and they married in 1965. Klaus worked six days a week at his Snowy River Motor Body works, opposite the West Footscray cemetery, and this Saturday night felt so good in so many ways, with his raven-haired wife, the quickening rhythm, ‘Roll out the Barrel’, jumping round the dance floor to the polka classics, leaning back and looking up at the ceiling of the barrel spinning round and round and round. Did I say the ceiling of a barrel? Suspend disbelief for a moment — there’s Jonah in the belly of the giant whale, there’s Alice in a giant Wonderland, and then there’s those lucky patrons of the Eltham Barrel who for two decades from 1968 were able to enjoy the delights of what would have to have been one of Melbourne’s quirkiest venues. The Barrel [we read] is situated on top of the sloping hillside above Eltham. It can easily lay claim to being the largest barrel restaurant in the world and the only one of its kind in Australia … The huge structure of the Barrel towers over the long winding road that leads to Kangaroo Ground … If the Barrel were to be filled with beer—instead of its many patrons—it would hold close to two million gallons. Such a fact is remarkable even in Melbourne which is noted for its voluminous intake of that alcoholic beverage. OK — let’s back up a bit. A multilevel Bavarian-themed restaurant in Eltham with a crazy architectural style. And just how many other big barrel restaurants were there in the world for this to be the biggest? It’s hard to get the origin story straight — but it might go something like this. Des Hill ran a toolmaking business in Doncaster, and was inspired to commission the Barrel by Bill Mueller, a local bandleader, who told him about the Dürkheimer Reisenfass restaurant, a giant barrel built in 1934 in Germany made from 200 spruce trees from the Black Forest. Renovated in 1958, it was the largest cask in the world, bigger even than the famous Great Heidelberg Tun in Heidelberg Castle which was made in 1751 from 130 oak trees. Another version of the story is that Des Hill saw the giant German barrel himself, on a business trip. Believe it or not there’s quite a history of giant barrels in Europe. On the back of a booming wine industry from the end of the 16th century, the nobility started to build large wine cellars with very large barrels to put in them. Mostly in Switzerland and Germany, there’s one in Mikulov Castle in the Czech Republic, built in 1643, 6 metres long and 5 metres in diameter, bound with 22 steel hoops. And there’s the Strasbourg wine barrel of 1472, the Tübingen barrel of 1546 with a volume of over 84,000 litres, and the giant Gröningen barrel of 1598. One huge barrel had a platform on the top and a gazebo, with room for six couples to dance. But the largest of all time—though never of course actually filled with wine or beer—was the Eltham Barrel, 26 metres high with a volume of 8 million litres. However it was that the idea came to Australia, Des Hill forked out $250,000 for construction, and Bill Mueller brought the music — that’s him beaming in a photo in the Age on the 16th of November 1968, dressed in lederhosen and Tyrolean hat, beer stein in one hand, violin in the other. Eugene Mercier’s giant 20-ton champagne barrel that was pulled through the streets of Paris by 18 horses and 24 bulls for the Exposition Universelle in 1889 was nearly 20 years in the planning and construction. 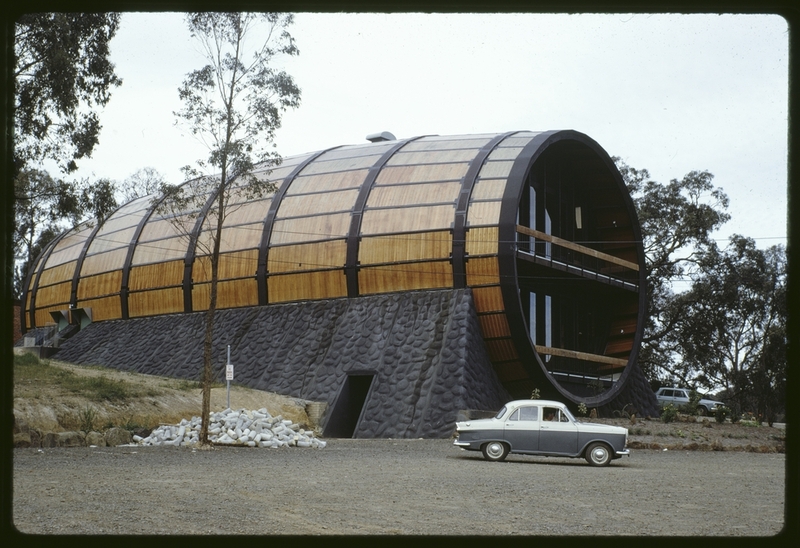 The largest barrel in the world, surprisingly, was built in Eltham in only about four months. The engineering was computed by William Lyle Irwin of Irwin, Johnston and Breedon, consulting engineers, South Melbourne. Bill Irwin was a civil engineer who specialised in bridges, and his CV also included the Swimming Centre for the 1956 Melbourne Olympics, the Myer Music Bowl, and the futuristic Academy of Science Shine Dome in Canberra (both opened in 1959). So a barrel was a cinch — just another day at the office — roof loading, frame design, balcony cantilever, diagonal bracing. The menu included tasty Teutonic titbits. Although the entire staff is of either Swiss, German or Austrian extraction the owner is a Melbourne engineer, Mr. Des Hill. He is the only man in the organisation who can’t speak German. The management took the German thing seriously. By December the Barrel was advertising for waitresses: ‘German speaking only, with GOOD appearance, wanted for new restaurant … Good pay, uniforms supplied meals provided, transport arranged’. They also wanted drink waiters, ‘Young men with experience’, though German language skills and good looks weren’t specified for the blokes. Public taste is like a rubber balloon [it pontificated]: you push it down in one place, it pops up somewhere else. 1967-68 saw the successful demise of a plan to build a 250′ high replica of a gin bottle on the Nepean Highway near Melbourne. Architects, critics and, apparently, the client, breathed a grateful sigh of relief. Undaunted, the public desire for novelty has been assuaged by this Barrel near Eltham (architect John F. Tipping, builder E. J. McGee P/L). Hardened alcoholics speeding down the Main Road at Research may believe the millenium has come. Straight-laced architects may have feared the apocalypse, but the punters loved it, and Des Hall had bookings through to 1970. The Barrel itself was an eclectic mix of new and old — some recycled convict-made bricks, and timber from the Cliveden Mansions in Jolimont, originally the city pad of landowner, philanthropist and parliamentarian Sir William Clarke, which was demolished in 1968 to make way for the Hilton Hotel. Bits and pieces of stained glass and joinery may have been salvaged by Whelan the Wrecker for the grand dining hall of the Hilton at the top end of town, but some of the Oregon framework made its way out to the city’s fringe. The metal hoops came from Whyalla, and the giant reclining barrel with its two-way curvature was clad with Swedish Stramit board, compressed straw insulation panels two-inch thick and four feet wide, finished with marine ply on the exterior, and natural wood-chip on the inside. Externally at ground level, random stonework beaching provided a kind of visual cradle in case you were worried that the whole thing might roll down the hill. A half hour drive from town, you came off the Eltham Yarra Glen Road, next to Danson’s Nursery, up the driveway, parked the car, and then entered the Barrel from a fancy sounding porte-cochère, a porch where cars could stop to drop off passengers. On this floor was the main dining room and a mezzanine cocktail lounge, a women’s powder room, food hoists behind a server covered with ornamental arches, a bandstand and a dance floor. A lower level housed a private function room for small weddings or private parties, a bridal change room, and the kitchen, pantry and cellar. On the top balcony level there was a gallery dance floor, another dining room, liquor and food servery, and a dumb waiter from the kitchen below. The three-storey restaurant had a supposed capacity of 8 million litres. In terms of people, it was initially registered for 190 patrons, soon upped to 290. Jack Tipping had passed away in March 1969, but his office worked on interior alterations that were made to the barrel in 1972. Things got into a kind of swing. Under the watchful eyes of stags’ heads mounted on the wall, the imported German beer flowed, couples danced to Syd Molnar and his Austrian boys, kids were scared or charmed in equal measure by Bonzo the Barrel Clown and Fritz the Friendly Bear at Sunday lunch. ‘It’s a Smorgasbord’, said the brochure, ‘so eat as much as you like’ — and their parents did, wolfing down roll mops, cocktail onions, fried chicken, leberkäse, cold cuts, fresh corn, and Barrel pancakes served with maple syrup, a specialty of the house. Seven years after it opened, someone dobbed the management in to the Health Department—licensed for just 290, the brochure boasted that its capacity was 400 guests, but in November and December 1975 there were over 500 people crammed in some nights, sitting on the stairs and queuing for the toilets. While the Barrel architecture was certainly a novelty, the themed restaurant thing had a long history. When it came to décor, it was common earlier in the twentieth century for Melbourne’s tearooms to be inspired by the allure of the exotic and the foreign, whether that be from Europe or from Asia. Caterers have long employed ambience, gimmickry and nostalgia, in shades of comforting retro or alluring modern, to entice repeat patronage. The Mia Mia Tea Rooms in Collins Street advertised the atmosphere of an old Dutch kitchen. In the 1920s its waitresses were dressed in Dutch blue and white lace caps in peasant fashion. Some tea-rooms played on the café chantant or singing café concept, others drew on Chinese or Japanese stereotypes in presenting an exotic version of other cultures: so 1920’s Melbourne had the Djin Djin and the Geisha tea-rooms, and the cultural othering served to reinforce the dominance of the Anglo majority. Or you could try the prime rib beef at The Stagecoach Inn restaurant in Queens Road, where you could dine and dance ‘in an early Australian Colonial atmosphere to the renowned music of the Four Coachmen’. There were other classic smorgasbords and themed restaurants: Flight Deck opened in the mid 1960s on Toorak Road in South Yarra, in the form of a Boeing 727 interior; and the Swagman in Ferntree Gully (from 1972 to 1991). By the end of the 1950s, [Whiteoak writes] subtly or overtly German-themed restaurants and cabarets began to appear as part of a vibrant Continental venue scene where European migrants, nostalgically seeking Continental food, entertainment and atmosphere, rubbed shoulders with Anglo-Australians wishing to experience something adventurous in food and entertainment. Then there were Salzburg Lodge and Edelweiss Austrian Licensed Restaurants in Heidelberg — the Xmas menu in 1974 boasted Jaeger Suppe, Consommé Franz Josef, Bismark Herrings, Matterhorn Cutlets, Wiener Schnitzel, and Tyrolean Roast Beef; at Edelweiss kids would be lined up on mothers’ day, each holding a tuned cowbell, and on the signal from a fellow in Bavarian kit would belt out Edelweiss for all the mums in the room. In 1975, building lots in the Eltham Heights Estate subdivision just down the road from the Eltham Barrel were advertised as ‘Country style living for city folks’. The Barrel spruiked itself as Melbourne’s newest swinging restaurant, but also and particularly an out-of-town dining experience: ‘Forget the rat race and enjoy the best with people who know what they want. This is no gimmick and prices are reasonable’. and the music, of course, the roll call of musicians in their lederhosen, Bill Mueller, the original bandleader and inspiration, his son Ernie Mueller on guitar, Syd Molnar on accordion (who also played at various times at Salzburg lodge, the Hungarian cultural centre, and the Cuckoo); Leslie Persely on clarinet; Ron Hayden who played the drums between 1975 and 1980, then went on to the Baron of Beef and the Society Syncopators. And then, there’s the fire, which despite the fire-resistant qualities of Stramit board, destroyed enough of the barrel on the evening of Sunday the 4th of June 1989 that there was an end to it. Fuel had been splashed on the walls, gas jets had been turned on in the kitchen, and there was a large hole in the cellar wall. The arsonist was never caught. So we are left with the memories of those who remember a night out at the barrel, as well as the owners and licensees, managers and workers: Frank Vogl, who went on to Salzberg Lodge and Edelweiss and who won the tender to open The Melba above the amphitheatre in the new City Square in 1980; brothers-in-law Peter Smith and Barry Jordan who owned the Barrel for about 8 years up to the mid 1980s. Occasionally the odd souvenirs comes up on eBay—an Eltham Barrel mug, an ashtray. Now there are houses on that block off Kalbar Road where the Barrel once stood. The inscribed Eltham Barrel beam that spanned the portico is doing duty in someone’s private home, and there’s a Bring Back the Eltham Barrel group on Facebook. It was something of a phenomenon in its day; it’s almost weirder now just imagining that such a thing ever existed — as a newspaper put it when it was sold in 1984, it sat ‘high on a hill like a refugee from Mars’. Let your mind’s eye wander, and you can see the orange glow of the inside light streaming out into the night through the cross-hatched timber frame like a comforting face; listen carefully enough, and you might hear the strains of Bill Mueller’s band, as a refugee from Europe swings his raven-haired wife across the dance floor, and in each other’s arms, at the end of the week, with all you can eat and beer steins overflowing, the past is the past, the future unknown, and right here and now, wrapped in the Barrel’s embrace, nothing else matters. “FAIRSEA WAS TWO-WAY MERCY VESSEL” Good Neighbour 1 December 1953: 2. Web. 18 Jul 2018 http://nla.gov.au/nla.news-article176527045; Fairsea Passenger List, Commonwealth of Australia, Department of Health—Quarantine Service. Michelle Fincke, ‘But the essence of Dad, I think, was adventure’, 22 June 2015, https://speakola.com/eulogy/for-klaus-fincke-by-michelle-fincke-2015, accessed 20 July 2018. Graham Hawley and Brian McKinlay, Diamond Valley Sketchbook (Rigby Limited: Adelaide, 1973), p. 44. Lost Eltham Facebook group, https://www.facebook.com/Lost-Eltham-1535993463348408. Pavel Pokorný, Obří vinný sud v Mikulově a jeho evropští konkurenti, http://www.rmm.cz/regiom/2004/obri_sud.pdf, citing Dieter Coburger, Das Riesenweinfaß an der Bode, Halberstadt. 1999; Methodius Zemek, ‘The Largest Barrel in Central Europe?’ South Moravia, vol. 24, vol. 27, 1988. Department of Health Public Building Files at Public Record Office Victoria gives early details: VPRS 7882/P/0001 Unit 1877; VPRS 8044/P/0003 Unit 457.
 http://www.apersonalhistory.com/WilliamIrwin/, accessed 20 July 2018. Age, 27 September 1968, p. 24. Age, 16 November 1968, p. 2. Age, 30 November 1968, p. 7. Age, 14 December 1968, p. 66. Age, 18 December 1968, p. 29. Robyn Annear, A city lost & found: Whelan the Wrecker’s Melbourne (Melbourne: Black Inc., 2003), pp. 232-3. Canberra Times, 24 June 1969, p. 11. See also ‘History and Heritage’, Ortech Industries, http://www.ortech.com.au/history-and-heritage. Public Record Office Victoria, VPRS 7591, P0004, Unit 73, Item 692/642, will, John Frederick Tipping. Andrew May, Espresso! Melbourne Coffee Stories (Melbourne: Arcadia, 2009, first published 2001), p. 35. See also TEA PARTY AT MIA MIA. (1926, May 8). The Australasian, p. 55 (Retrieved July 25, 2018 from http://nla.gov.au/nla.news-article141413080. Tanja Golding, ‘Tea tales: A history of the cultural and social significance of tea and tearooms in Melbourne and Australia’, History Honours Thesis, University of Melbourne 2009. Age, 4 February 1969, p. 16. John Whiteoak, ‘Making “Gemutlichkeit”: Antecedents of “Bavarian-style” Musical Entertainment in Australia’ in Dan Bendrups (Editor). Music on the Edge: Selected Papers from the 2007 IASPM Australia/New Zealand Conference. Dunedin, N.Z. : International Association for the Study of Popular Music, 2008, p. 181. Age, 1 June 1976, p. 19; 13 May 1980, p. 21.
 https://www.discogs.com/Eddy-Zlaty-Rheinland-Music/release/9014426; Herald-Sun, 21 March 2016 at http://tributes.heraldsun.com.au/notice/260872034. Age, 18 October 1975, p. 118. Age, 1 April 1969, p. 16. Lost Eltham Facebook group website. Karen Kissane, ‘Welcome place-mat is out for children’, Age, 14 July 1978, p. 36. Age, 27 June 1978, p. 15. Lost Eltham Facebook group site. Age, 12 July 1980, p. 4. Age, 18 August 1984, p. 43. We kick off this episode with a new segment—’Dear Diary’—in which we feature Melburnians who have kept a regular and personal record of events in their lives, that can tell us something about life in the city and the nature of historical change. Richard Gillespie will delve into the diary of Edward White, the man of space and time. 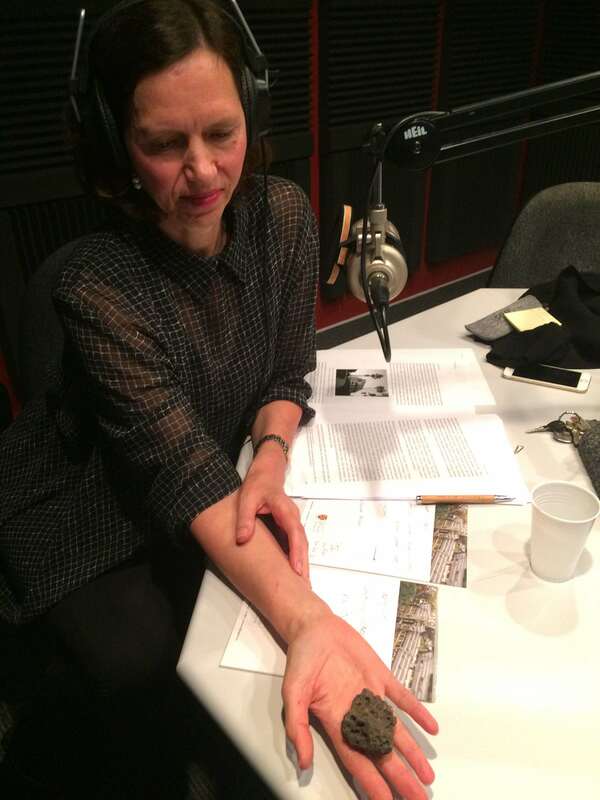 Alex Roginski will continue our ‘On the Beat’ series with a story of a murder in the Eastern Market; and I’ll go looking for Melbourne writer Jean Field. It is January 1853. The ship ‘Try’ sails through Port Phillip Heads, on its way to Melbourne, after a three-month journey from Bristol. As the ship makes its way into Port Phillip Bay, an intrepid immigrant has the best view. Dared by the crew, passenger Edward White, just turned 21, is inching his way along the rope leading between the two masts, near the topmost sail. It was a grand entrance to the settlement that would be his home for most of the next 60 years. White noted that evening in his diary that the escapade ‘tired me very much, and caused the captain to censure the mate for daring me to do it’. This entry is just one of thousands of entries in Edward White’s diary, which he commenced on his nineteenth birthday in 1850, and maintained until his death in 1913. Each daily entry is brief — about 60 words or thereabouts, occasionally more, often less. The small, notebook-sized volumes remain with a descendant, but a typescript, in nine bound volumes, can be read at the State Library of Victoria. At one level, the diaries are the detailed account of one man’s life in Melbourne, charting the daily events that cumulatively build a picture of his career, family life, and social milieu. But they are also more than that, for Edward White’s career was dedicated to charting the stars, calculating Melbourne’s precise location on the Earth, and linking Melbourne time to that of the rest of the world. He, more than any other single immigrant, was the observer who would fix Melbourne in space and time. As commentators at the time noted, the Victorian gold rushes attracted an extraordinary number of educated and skilled immigrants. While the prospect of finding gold may have been the catalyst, they had skills and trades they could fall back on, should their digging go unrewarded. White fits this mould. When he commenced his diary at 19, he was working as a mechanic and marine engineer in Bristol. His evenings and weekends were dedicated to a self-education program — the diary was clearly intended to mark his progress. 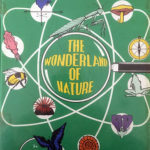 White would read the newspapers and journals, and borrow books: Humboldt’s Views of Nature, Lardner’s History of Discoveries, Dempsey on Drainage, Herschel’s Astronomy; novels by Dicken; textbooks of algebra, French and Latin. He bought a telescope and navigator’s quadrant, made observations from his garden, and prepared a chart of the orbits of the planets. By mid-1852, he was reading Chamber’s Guide to Australia, building a wooden travelling chest, and buying a pick, shovel and lantern to take to Port Phillip. Characteristically, the voyage on the ship to Australia became an exercise in practical navigation. White made astronomical observations each day, then used these to calculate the latitude and longitude of the ship. The ship’s captain would have been using a chronometer to establish the ship’s longitude, but White used the earlier lunar tables method; he first observed the position of the moon against background stars, then made complex mathematical calculations in order to determine the ship’s position on the earth’s surface. This was an intellectual exercise that would set the course of his future career. Arriving in Melbourne, White pitched a tent in Canvas Town, the makeshift settlement for new arrivals in South Melbourne. Discouraged by reports of the slim pickings on the goldfields, he found work in a store in Flinders Street. Sundays were spent in the tent doing mathematical problems. One evening, he returned to his tent to find everything stolen. For the next five years, White led an unsettled existence, enjoying the freedom of changing jobs every few months. For a time, he tried his hand as a gold miner, with poor returns, but found better work as a mechanic, tending the steam engines being employed to crush the ore in the larger mines at Bendigo. Throughout it all, he found time to continue his education in mathematics and astronomy. He even took a week off, so that he could come to Melbourne, to read astronomy books at the University and Public Library. Comets and meteors have traditionally been seen as foretelling significant events. Certainly, it was a comet that transformed Edward White’s life. 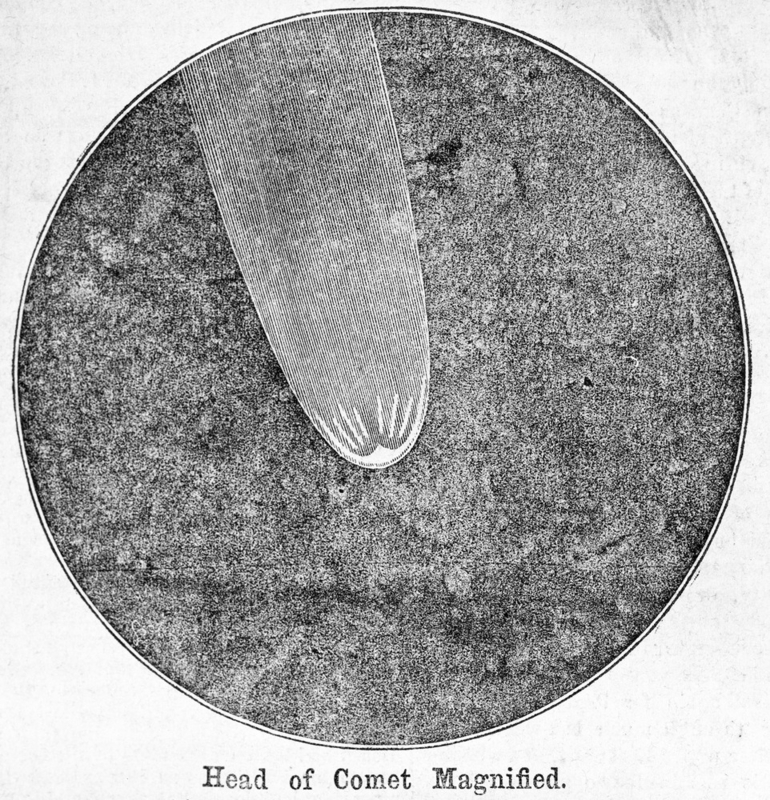 The Great Comet of 1858 was one of the brightest and most beautiful comets of the nineteenth century. Observable over the course of several months, it prompted public interest around the world. 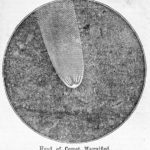 White’s diary notes that he systematically observed the comet for over a fortnight, from the dark skies of Bendigo, then spent an entire Sunday analysing his data; that evening, he wrote a letter to the Melbourne newspaper, The Argus. His letter was published the following weekend. Later that week, two soldiers appeared on the goldfields asking for White. Redcoats on the goldfields could only mean trouble; friends advised him to hide. Brushing off their concerns, White introduced himself to the soldiers, who handed him a letter from the Government Astronomer in Melbourne, Robert Ellery, who asked White to visit him and indicated a job may be on offer. Years later, reviewing his diaries, White underlined the day’s entry in red, for it marked the beginning of his long career as chief assistant astronomer at Melbourne Observatory in the Domain (now part of the Royal Botanic Gardens). 18 June 1864, Saturday – ‘Weather fair, rain at night. Rose at 7, worked in the garden, went to the observatory, entered some transits, in the afternoon made some fixings for the fowl house, at 6 went to the observatory, observed some stars, left at 8, came home, read some of Coles’ Gardening in Victoria … went to bed at 11.15. 14 May 1873: ‘Weather fine. Rose at 5.50, went to the observatory, observed some transits, came home, read the Argus, went to the observatory, entered some transits, at 11.30 went to Melbourne to Fraser’s, bought a pair of vases for 2 pounds 15 shillings, returned, entered some transits and conversed with Mr. Todd [this was Charles Todd, the visiting South Australian astronomer and superintendent of the Overland Telegraph], observed a few transits, went with Mr. Todd to the Theatre Royal, saw Pygmalion and Galatea, left at 10.05, accompanied Mr. Todd to the Station, came to the observatory, observed some transits, left at 11.50, came home, to bed at 12.20. Numbers mattered to White. Much depended on the accuracy of his astronomical observations. The precise measurement of stars as they touched the cross hairs in the observatory’s large transit telescope was recorded against an astronomical clock. Then each observation had to be adjusted for disturbances, such as the refraction of the Earth’s atmosphere, and the tiny perturbations in the Earth’s movement around the Sun. From these, White could progressively build a catalogue of thousands of stars; the Melbourne Catalogues, published every ten years, were celebrated internationally as the most accurate charts of the southern skies. White was made a Fellow of the Royal Astronomical Society in London for his achievement. But these painstaking observations had a more practical aspect. 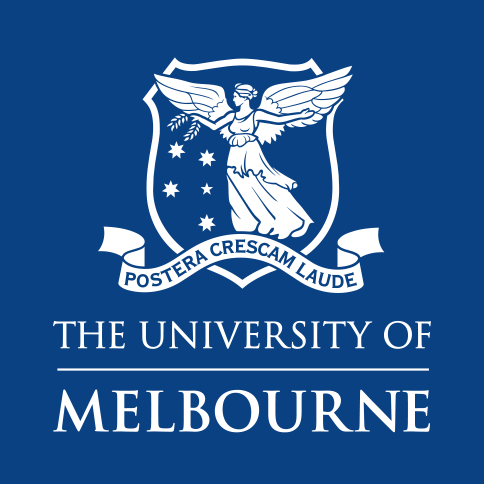 They determined the latitude and longitude of Melbourne, which in turn were used as the basis for an accurate geodetic survey of Victoria, fixing the precise locations of survey markers across the colony. From these, government and private surveyors could divide up the colony, for the gazetting of crown land, awarding of pastoral leases, creation of Aboriginal reserves, and the sale of private land. There is a disturbing act of dispossession hiding behind those seemingly innocent columns of numbers. Melbourne and the colony lived its days and nights by White’s time. Observatory Time was transmitted by dedicated telegraph lines from the observatory to public clocks at the Post Office, Town Hall and railway stations, then to every station throughout the colony. As telegraphic connections were made with other colonies and countries, local time and longitude could be mapped ever more accurately. From 1883, Melbourne was linked through Darwin and India to an international grid of space and time. Not that White’s diary is solely confined to measurement. His courtship with Kate L’Oste is recorded, his marriage, then the births of his eight daughters and one son, their illnesses and achievements. Night-time observations of stars are interspersed with social evenings, games of whist, songs around the piano, visits to the theatre, meetings of the Royal Society and Alfred Hospital board, repeated visits to the international exhibitions, and attendance at garden parties at Government House, next door to the observatory. But, all the same, there is a wonderful obsession with numbers and stars. White liked to take long walks on Sundays, timing each mile with his watch, as he passed the mile posts from Melbourne to Doncaster. On holiday with family at Sorrento, he took barometric observations as he climbed nearby hills. For 25 years he wrote the monthly ‘Astronomical Notes’ for The Australasian journal. One daughter was named Estella, as her birth coincided with a comet. Edward White had a heart attack in January 1913, aged 81; his last diary entry was at the end of April, and he died three months later, at his home adjacent to the observatory. White’s house was demolished in the 1920s, in order to build the Shrine of Remembrance. Appropriately, White’s astronomical observations formed the basis of the calculations to design an aperture in the roof of the Shrine, in such a way that a ray of light would fall on the Stone of Remembrance at exactly 11a.m. on the 11th November each year. The observer of space and time left his mark on Melbourne. We start with gunshots. They reverberate through the upper storey of Melbourne’s Eastern Market. At a stall marked with icons of suns and stars and a head in profile, the air quivers with adrenalin. A man aged in his forties lies motionless on the ground, blood from bullet and stab wounds seeping into his linen shirt and necktie. It is April 1899, an autumnal afternoon in one of Melbourne’s beloved amusement spaces, home to florists, fruit sellers, cycloramas, bird fanciers, photography studios and shilling mystics – gatekeepers of divination and character reading. The phrenologist Emery Gordon Medor has just fired his revolver into Frank Cartwright, aka Frank Stevens, actor and owner of the cyclorama, and his phrenologist wife Annie Cartwright, professional name Zinga Lee. The crime shocks Australia. Newspapers from the Clarence River to Kalgoorlie cry ‘Murder in the Eastern Market’, ‘Phrenologist runs Amok’. The case hits all of the high notes of late-Victorian Gothic. As with most murders, of course, we must scrabble in earlier times for motive. Emery Gordon Medor was a phrenologist, a practitioner of the science of reading character and intellect from the shape of the head. Phrenology cascaded through public life in Australia from the early nineteenth century until well into the twentieth. The cranial science served as a frequent pastime of middle-class folk – including doctors and social reformers – but its itinerant popular lecturers and character readers scraped by in the margins of society. They shifted identities and forged unholy combinations of phrenology with other forms of divination. Various records suggest that Medor was born in the 1840s in either New South Wales or South Australia, although none of this is terribly reliable, and Medor was probably a stage name. This man shambled into regional Victoria in the 1880s, lecturing on phrenology and offering private consultations filled with life advice. He married, had children, abandoned them. Medor settled in Melbourne in 1890 and the Eastern Market drew him into its colonnaded embrace. Originally a hay, corn and fresh produce market, the square bounded by today’s Exhibition, Little Collins, Bourke and Russell streets whirred from morning until night. The new market buildings, completed in 1878 during the age of exhibition, rose up in neoclassical splendour. During the day, sunlight poured through the market’s vaulted glass ceilings onto two levels of stalls and a fountain at the market’s heart. At night, electricity bathed Saturday-night hordes – respectable folk, as well as clusters of larrikins. It was a village of leisure within a city. For a decade, Medor trod the short path from his lodging house in Little Bourke Street to the south side of the Eastern Market, his frock coat perhaps flapping in the breeze, tall silk hat bobbing above the heads of passers-by. He was tall for the time, well fed, with a hook nose. He read palms, heads and the stars from a stall divided into two rooms by a curtain of coarse red fabric. When not in his inner sanctum, he perched out the front of his stall, expounding his theories of the universe. Medor believed himself a cut above other fortune tellers. He was not an astrologer but what he called a ‘sidereal scientist’, a man of ancient wisdom who had supposedly predicted the London fires. Like many other phrenologists, who fussed over the legitimacy of their profession, even as they bundled it with thoroughly disreputable practices, he scoffed at the so-called impostors and quacks who told fortunes under the cloak of phrenology. He meant specifically the tenants next door, Frank and Annie Cartwright, who also peddled phrenology and physiognomy, as well as charging admission to a great panorama. Medor blamed his competitors for a slump in business. He thought Annie Cartwright scared away customers by lolling about outside in her ornate costume. It was a perceived loss aggravated by the practical jokes played by his neighbours. With a small gang of acquaintances, they began to make sport of the resident eccentric. He detailed the injustices: a cross marked on his stall door, a stolen shutter, verbal abuse in the street. His tormentors set ragged boys with mangy dogs running through the stall. One night on Medor’s walk home, a man asked for matches and then grabbed him by the throat. He began carrying a revolver. Medor’s neighbours failed to see what a country journalist had long ago perceived, that this was ‘one of the few men one would hesitate to play practical jokes upon’. Medor drank. In the late 1890s, he saw a Dr Stirling for iritis, or eye redness, the complication of syphilis, a disease known for unsettling the brain. ‘I came to the conclusion that he was a shingle short, on the border between sanity and insanity’, said the doctor. Perhaps some of the supposed persecutions were untrue, or unconnected to the Cartwrights. Perhaps Medor misinterpreted their spirit. By April of 1899, the City Council – which was trying to clean up the market – had a gutful of this demi monde of character readers and their grubby disputes. Fortune telling was illegal under vagrancy laws, seen as obtaining money under the false pretences of being able to predict the future. The town clerk issued a notice to be circulated to tenant fortune tellers, warning that if they didn’t discontinue this practice they would have to vacate by May. The notice was due for posting at the time of the murder. In the week before the crime, Medor went on a bender. Returning to work at the end of this bout, he found a sign on his door, stating that the shop was ‘Closed, in consequence of the death of Venus’. His blood boiled, blood rapidly draining of alcohol. On the afternoon of the tenth of April, he strode across the market to see a bunch of radishes affixed to his stall door. His tolerance frayed, he accosted Annie Cartwright, who lounged against the phonograph outside. He aimed for her heart with his revolver but caught her arm instead. She fled. But Frank Cartwright soon ran into the stall. Medor’s shots to Cartwright’s head and right buttock felled him, and as he lay on the ground, the phrenologist stabbed him through the chest and began working on his neck with a blade. It was then, as Medor commenced decapitation, that Barnet Freedman, the picture frame manufacturer, rushed in to disarm him, a tussle that would cost Freedman an eye. A coronial inquest a week later committed Medor to stand trial for murder, but the process would be delayed and complicated by the question of sanity. Medical men, and then jurors, could not agree. Was Medor mad? Was being ‘a shingle short’ sufficient to acquit someone of such a gruesome attack? Madness was deduced from Medor’s physical state, his post-bender withdrawal, which one physician from St Vincent’s hospital dubbed an ‘acute alcoholic mania’ that predisposed him to react to even the slightest irritation. But the court also considered Medor’s faith in his own powers. For Dr Stirling, the commerce of mysticism could be excused as long as its practitioners understood that they traded in make believe. His belief in astrology & demonology influenced me. As he made his living by the practice of astrology I would expect him to be candid enough to tell me he did not believe in it. After the first trial foundered in deadlock, a second jury in July found the phrenologist not guilty. But Medor became a guest of the governor for as long as the state deemed him in need of restraint. He wasn’t sent to a mental asylum, though, but to Melbourne Gaol. From this bluestone capsule, Medor wrote missives to a publican friend, asking for help in seeking a remission of incarceration. These letters reveal a grandiose sense of self, and a failure to grasp the gravity of his actions. It is a terrible thing to me, to have to remain in this place, among so many brutes in human form whose conversation is the abomination of abominations. I could not believe that man is so vile and fallen, if I did not hear him at his worst, as he is in this marvellous Melbourne. There is more at the bottom of this unfortunate affair than appears on the surface. The quack palmists and Phrenologists are not those only who are interested in my detention. Meanwhile, Annie Cartwright recovered from her gunshot wounds, and like any good phrenologist in a fix, took to the road, working under her stage name of Zinga Lee. Medor spent most of the next decade in Melbourne Gaol, before a transfer to the Bendigo Gaol in 1908. In August of that year, a deputation of friends and fellow storekeepers visited Attorney General John Davies, pleading for his release. Davies rebuffed them. He said that seven doctors had assessed Medor over the past decade and declared him a danger to the community if appropriate precautions weren’t taken. But the governor and the medical officer at Medor’s new home in Bendigo kept him under close watch. By May 1909, they deemed him mentally fit, and he stepped out through the gates of Bendigo Gaol, an elderly man, released into the care and supervision of friends. Who knows if Medor’s sanity improved. How does one measure madness? Had he renounced the reading of fortunes? Was his fitful violence banished with his former, drunken self? Perhaps the gaol’s governor and doctor both thought him too harmless to worry about, sane or not. Regardless, the blood had dried on the case, and maybe Medor won them over with a touch of Eastern Market magic, a conjuring trick in which reality could be moulded at will to recreate the past as you think it should be. I was sitting writing a letter the other day and rose to peep through between the blind and window frame to see how the day looked out of doors when at the same moment a black horrible looking face suddenly came into very close proximity to mine but on the other side of the glass. It was that of an old native woman who activated by the same curiosity as my own no doubt wished to see through the same aperture what was inside. That’s a curious young man, newly arrived, looking out at Collins Street 175 years ago. I came across that diary in the late 1980s, and remember thinking that through that window frame of time, I knew as little about the writer as he did of the Aboriginal woman in the street outside. A few years later I came across a slim little book called And so today by Jean F. Field, subtitled a ‘picturesque cavalcade of the years between’. Published in 1956, and dedicated to the Women Pioneers of the District, And so today sketched the early histories of Melbourne’s eastern suburbs in a little over fifty pages, covering Blackburn, Box Hill, Doncaster, Nunawading, Mitcham and Vermont. Here in six short chapters, Jean Field explored the early European occupation of these localities, the hamlets and the stock routes, the blacksmiths and prospectors, the Town Halls and traders, tracking the past along railway lines and old post and rail fences, through the cemeteries, the quarries and churches, to the landscape of the early postwar decades. Black and white photos of the largest lemon scented gum in Blackburn, apple orchards at Vermont, and an old wattle-and-daub homestead in Doncaster, gave a hint of something lost as well as something found. Jean Field’s view of Metropolitan Melbourne in the mid 1950s staked out a territory of centre and edge, orchard and subdivision, the old and the new, the slum versus the suburb, the blandness of the plains against the promise of the hills, the weariness and disadvantage of the inner-city replaced by the dream of a better and more spacious future. Our great city of Melbourne is like a large star with a solid centre and many points spreading out North, South, East and West, but the longest point of all thrusts out towards the blue Dandenong Ranges, an easy afternoon’s run in the car from Town. The lovely, undulating country of the lower foothills, with its many orchards and small farms, is rich and fertile … Apples and pears, lemons and peaches all grow in abundance. It is to this country that the City-weary, and the dreamer, the Artist and worker alike have turned their eyes and have bought for themselves blocks of land and built on them their dream home. The uncanny way in which the human being turns his eyes to the hills, and the latent instinct which sleeps in all of us, to come, if we can, closer to nature, is being proved day by day, as more and more men and women prefer to strap-hang in trains and buses from the hills for as long as an hour, rather than live close to the City in flats and apartment houses. Lucky indeed is he who can say to his fellow worker, ‘I come from the Hills’. 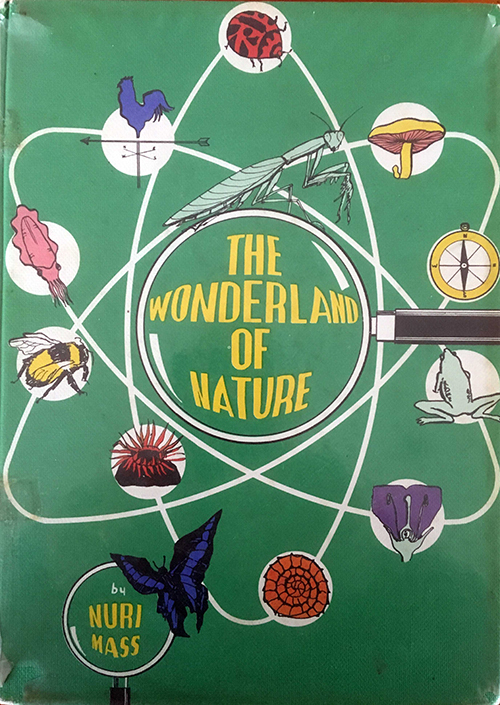 The things that impressed the visitor to these districts in the mid 1950s were the perfume of the gums, the sense of peacefulness, and the wonderful birdlife. Indeed And so today is not just a celebration of the early settlers, but is marbled if not with nostalgia or loss, then a certain sense of longing and threat. The paradox of the new suburbs, as Field saw it, was that the very qualities that made these undulating hills attractive to the inner-city dweller were obliterated in the process of suburban development. It is sad … to see the orchards going one by one, subdivided into blocks of land, some of them only 50 feet wide; to see men having to leave one congested area only inevitably to live in another. The money-hungry and the grasping are always with us. ‘Closer Settlement’ the cry rather than ‘Let us Breathe!’ A beautifully timbered block is sold to a man who is uncivilised enough to carry the instinct with him to destroy before he can build, who clears his block of trees overnight, and then gloats to his friends that he is now living in the beautiful suburb of, say, Blackburn or Croydon. The man who sees in his gums only six months’ free firewood and not the blessing of a lifetime. Rather than cut these trees down, he should go down on his bended knees and thank God that he doesn’t have to live on the top floor of a 23-storied apartment house. ‘Are we to make a desert of this country of ours’, she asked; if so, ‘we will be despised and hated by our descendants, who will rightly blame us for our lack of thought and perception and … sense of duty to those who will come after us’. There’s quite a spirit that animates this little volume, amid the rapid growth and the tensions of change, and the estate agents and spec builders supplying pent up post-war demand. There’s a wonderful eye for the hue and temper of the cultural as well as the natural world: the cliqueyness of Vermont, the Englishness of Doncaster, and Blackburn ‘the embodiment of everything Australian’. There’s also a profound sense of the efforts of the individual—her proud pioneer—in the face of the larger forces of history, of planning and change. And it’s a book with its boots in the places themselves, an early oral history as it were, as Jean Field sat down with the nonagenarians who could remember the very early days of white settlement, her informants the Livermores and Toogoods, the Thieles and Zerbes —old orchardist families and other long-standing locals who claimed a kind of primordial right of ownership over the spirit of these places. You could understand why they felt that their way of life was imperilled. Melbourne’s population nearly doubled between 1947 and 1971, with the addition of one and a quarter million people, the highest inter-censual growth occurring in the period Jean Field was writing. In the immediate postwar years, the old industrial suburbs of the inner core—Brunswick, Collingwood, Fitzroy, Richmond, Port and South Melbourne—had stopped growing in population; some of the middle-distance suburbs like Hawthorn, Malvern and Prahran were actually in population decline; but at its circumference in the east and southeast, the metropolis was growing through the out-migration of young families from the inner suburbs. It would be another generation before these interlopers could themselves be called the new suburban pioneers. Imagine — Jean Field gently prods her reader — imagine as you stand on this regular footpath by this huge highway in this modernising suburb, what it used to be like. We can read what she wrote, words on a page, but I wanted to know more about this intriguing Jean Field who came to write so keenly and poetically about a sweep of Melbourne suburbs. Who was this woman, so eager to ensure that the go-ahead and aggressive instinct for the future should be tempered with what she called ‘historic sentimentality’, an understanding of origins, an appreciation of individual effort, an awareness of legacy. Who was this writer who tempered her musings with a sentence from Psalm 121, with snippets of Buddhist philosophy, and with smatterings of Rabindranath Tagore. What was the face of this woman on the other side of the glass? I started to look for other clues, reading the book in a different way. There comes a time in everybody’s life when we stand still, as it were, and take stock of ourselves and our surroundings. A time when, if we are married, perhaps our children launch themselves onto the tide and leave us, a little perplexed, a little lonely, with an emptiness in our hearts and with time on our hands. Blackburn, she wrote, is the ‘home of the business man who, although he must be in his office at 9 o’clock each day, comes home with a sense of freedom, a sense of burden having been cast off, as he steps through the station gates’. Was Jean Field feeling a little empty, a little perplexed, in inverse proportion perhaps to the freedoms of her husband and her grown up children who had now spread their wings? There’s something else of course that haunts this book, if we read it forwards rather than backwards in time from where we are. It’s the war. It’s actually even two wars. Jean Field was realist enough to know that the subdivision of her idyllic country was inevitable, because, as she wrote, ‘so many sons of farmers and orchardists were either killed in the war, leaving a very heavy burden for the old folk, or because of the war, sought employment in the city and elsewhere’. Her suburbs are the solace for the troubled souls returned, those who have ‘a craving for the wide open spaces after World War I’, where once more ‘a man can be himself in his own garden’. The title of the book, And so today — whether consciously or unconsciously we can’t be sure — mirrors American poet Carl Sandburg’s eulogy to the unknown soldier in Washington after WW1. Looking for Jean Field led me to scour online newspapers, electoral rolls and other records for clues. In the 1950s, Jean Florence Field (home duties) and her husband Dudley (a manager) live in Nunawading. The couple first appear in Kew in the late 1930s, Vermont immediately after the war, Blackburn in the early 1960s, and later at Sorrento. Dudley Frederick Field was born in 1907 in Moonee Ponds and later lived with his parents in Kew before marrying Jean in 1932. When he enlisted in the Citizen’s Military Force in 1928, he was working as a salesman at Ball & Welch in Flinders Street: 5 foot 10 and a half, brown eyes and hair, Protestant, son of R.C. Field of Torrens Street, Canberra; a black and white mug shot showing Dudley’s dark complexion and short painter’s brush moustache. There’s more about Dudley online—a catalogue entry for an album of Federal Capital Site photographs, owned by Dudley, with reference to his father Robert Charles Field who was Steward of the Commonwealth Parliament House Refreshment Rooms in Melbourne. Robert Field is listed as being a member of the Federal City Camp on Kurrajong Hill in 1909, a three-week survey to determine the future site of Canberra. Dudley, it turns out spent his war as a major in the 22nd Battalion — Hank Nelson interviewed him for the Keith Murdoch Sound Archive project, Australia in the War. Suddenly, surprisingly, I heard Dudley’s voice from a room in Sorrento in April 1991, getting to Rabaul, evading the advancing Japanese, evacuation to Australia, secondment to the RAAF as their chief chemical warfare instructor, and his role as senior member of the Darwin War Crimes trials. What was your personal reaction to the news that you were going to Rabaul and what was the reaction of the men? I don’t know that there was any great … it’s difficult now to say. I mean the main thing, you were going to the war; you were doing something. There was quite a lot of disappointment that we were not going with the – over to the desert to join the rest of the boys. That was a very, very strong feeling which, of course, was there all the time. Maybe Jean was in the room that day in 1991, reliving her husband’s war, her own years of isolation. But that’s definitely Dudley in her book, ‘the man who, with pipe in mouth and dressed in faded army jacket, will potter all the week-end amongst shrub and hot-house and let the rest of the world go by’. I don’t think Jean begrudged him that. The same day I heard Dudley’ voice online, I received a parcel in the post of two of Jean Fields other books that I had tracked down in second-hand booksellers catalogues. If And so today was the celebration of the suburbs, These joyous sands (1959) was the city’s counterpoint — a history of early European settlement, the Sorrento convict experiment of 1803, the foundation of Melbourne, pioneering on the Peninsula and the early days of Dromana, Merricks, Mornington and Rosebud. We learn that Dudley had built a holiday house at Sorrento, and that Jean’s connection to what she called her ‘small paradise’ could be traced to when as an eight-year old girl she first went to Sorrento where her father rented then purchased a limestone villa, ‘Craigie’, facing the front beach. These were the times when annual summer holidays lasted from the middle of December until after Easter, when Jean’s mother would ship ahead the summer’s provisions, homemade butter packed between layers of salt in an earthenware crock, home-cured bacon and ham, and all the clothes, bedding and cutlery necessary for Jean, her father, sister Doreen, baby brother Robert, governess, maid and dog. The Peninsula would steady her sense of self. In the early 1940s, with two young sons of her own and Dudley away at the war, ‘I turned’, she later wrote, ‘like a homing pigeon to the scene of the happiest days of my childhood’, despite ‘a gnawing loneliness which sometimes seemed as though it would engulf me’. The day I first heard Dudley’s voice, I saw Jean’s handwriting — the second volume in my package was a signed copy of Grey ribbon to the border (published in 1973). On the dustjacket, a map of the Hume Highway anticipated the book’s subject, an itinerary of the route when it used to run through Kilmore and Seymour, Avenel and Euroa, through Benalla, Wangaratta and Wodonga to the border. Dudley is acknowledged for typing the manuscript, her father as ‘a prince of story tellers, who in my youth gave me a life-long interest in Victorian history’. She wanted to excite her reader with yarns and stories as much as with facts and figures; starting from one or other of Melbourne’s early watering holes — maybe Macs Hotel in Franklin Street—stopping first at the Sarah Sands ‘at the gates of Melbourne’, then out through Pentridge, Campbellfield and Kal Kallo before the road begins to rise in the foothills of the Great Dividing Range. There are further glimpses too into the landscape of Jean Field’s imagining, what she felt about why she wrote. To say that this thing or that that was the dominating factor which led one of us to take a certain step in our lives would, I think, be wholly wrong. Rather let us say that a chain of events, dating back to our ancestors, influenced us to become what we are. The events are the milestones along the way, our inherent inclinations the finger-post pointing this way or that. Our lives the roadway, running in straight unrelieved lines, or twisting and turning up hill and down, leading us to heights unexpected, vistas unimagined or quagmires unpredicted, through vales of shadows and again through sunny patches. So Jean had travelled this road herself — that grey ribbon to the border of the old Route 31, but also the personal road, troubled by shadow as well as warmed by sun. Where, I still wondered, were her finger posts and inherent inclinations, what ancestors influenced her to become what she became? The book has a few more breadcrumbs on the trail — that she herself as a child lived on a property somewhere near this busy highway, on land first taken up by the pastoralist known as Big Clarke, who had claimed land at Sunbury in the mid nineteenth century. A fourth Jean Field book I read in the library — Waggon wheels thro’ the wild flowers (published in 1977), again dedicated to ‘Those unsung heroines of the Australian Bush The Pioneer Women’. This was a small study of the Grampians region, the Carter family of Glenisla Station, and the settlement of Hamilton, Horsham and Halls Gap. And in a footnote on page 19, a reference that finally gave me a solid clue: ‘The diary of my grandfather, William Adeney, describes a visit to Mr Ware’s station … in the 1840s, where he assisted in the treatment of sheep for scab’. With the Adeney surname, Jean Field’s ancestry and influences come further into the frame, and newspapers give us further glimpses of her life. Jean Adeney, born at the family mansion ‘Clifton’ on 16 acres fronting Cotham Road Kew in 1908, which stood on the site of the Cotham Private Hospital. By 1912 her father Stanwell Alfred Adeney is listed as a farmer on the Melbourne Road on a property called ‘Stanton’ in Gisborne. Jean got her middle name from her mother Florence, and when she was a year old, her parents took her to visit Florence’s mother Elizabeth Rose in Bunbury, WA—just in time, as the old lady died a year later. The Gisborne Gazette tells us that 8-year old Jean was elected treasurer of the local Children’s Red Cross, and at nineteen visited her uncle in Bunbury, where she wore a smart flame taffeta dress with touches of gold to the local Rowing Club Ball. And what of her grandfather, William Adeney, who perhaps with his young wife Emily Day was the well spring of her pride in ancestors and her sense of history. Perhaps family stories were passed down to Jean about William and his own philanthropic father, a tailor of Sackville Street in London who was sub-treasurer of the London Aged Christian Society. William and Emily were married in Hawthorn in 1878—he just shy of 60, she not yet 20. In the 1840s William had taken up a run called Choclyn, on the eastern side of Lake Colongulac near Camperdown, first with sheep, then cattle after the foot-rot set in. A JP, appointed a Board Member of the National School at Timboon, and erstwhile President of the Camperdown Cricket Club, he eventually retired to the house in Kew, and was later remembered as ‘a good honest man, of a somewhat retiring disposition’. But to bring this story of faces and places full circle, it was William Adeney who was that young man who looked through a Collins Street window in 1843, at the Aboriginal face on the other side of the glass. What did he think of the Aborigines? You can read his diary in the State Library of Victoria, and it includes accounts of frontier violence around Portland Bay and elsewhere, shepherds killed by Aborigines, the retaliation of ‘our half savagized country men who are often guilty of dreadful wrongs’, their victims’ skulls used as shaving boxes. There are also family stories among descendants, of other diaries burned, in which William recorded prominent families poisoning local Aborigines. The terrible retaliation of the white settlers against the aboriginals does not make a pretty story and some say it should be allowed to sink into oblivion, but here I disagree — too much has been told of the treatment of the black man towards the white, the spearing and stealing of cattle, etc, while on the other hand the treatment meted out by the white settlers to the aboriginal, has nearly always been soft pedalled. Time carries us on relentless wings, and history links together the past and the present. Tomorrow becomes yesterday in a moment, and what we do today, whether it be good or evil, is irrevocable. 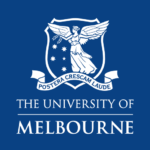 © The University of Melbourne, 2018. All Rights Reserved. A sketch of Medor’s stall door appears in the Weekly Times, 15 April 1899, 17. Post-mortem report, The Queen v Emery Gordon Medor, Criminal trial brief and related papers, 1899, Public Record Office Victoria, VPRS 30, Unit 1179, Item 224. These and other categories of tenants appear in the town clerk’s papers related to the Eastern Market for 1899 (PROV, Town Clerk’s Files – Markets, VPRS 3181, Box 565). See also: The Australasian, 6 April 1901, 43. The Cartwrights were frequently referred to as Frank and Annie Stevens by neighbours and reporters. ‘Zinga Lee’ was sometimes spelled ‘Zingalee’ or even ‘Zingaralee’. ‘Phrenologist Runs Amok’ became the headline in a syndicated story published in papers including The Daily News (Perth), 11 April 1899, 4, and the Emu Bay Times, 11 April 1899, 3. Medor’s prison record describes him as a native of New South Wales born in 1841 (No. 28816, Central Register of Male Prisoners, PROV, VPRS 515, Item 53). The police gazette notice published in 1909 at the time of his release notes a birth year of 1844 (Victoria Police Gazette, 27 May 1909, 224). In an 1897 interview, Medor declared himself to be John Brodie Gordon Pirie, “son of William Frederick Duncan Pirie, after whom Port Pirie in South Australia and Pirie street in Adelaide were named” (Table Talk, 10 December 1897, 9). However, this is at least a partial embellishment, as the town was named after the ship John Pirie, itself named in honour of Sir John Pirie, Mayor of London and one of the founders of the South Australian Company (‘Port Pirie: South Australia/Australia’, in John Everett–Heath (ed), The Concise Dictionary of World Place Names, 3rd edition, Oxford University Press, 2014, available online at http://www.oxfordreference.com, accessed 30 March 2018). Argus, 13 April 1899, 6. Wagga Wagga Express, 13 April 1899, 4. According to the Kalgoorlie Miner, he moved into his Little Bourke Street lodgings in 1890 (11 April 1899, 5). Colin Cole, Melbourne Markets, 1841–1979 (Footscray: Melbourne Wholesale Fruit and Vegetable Trust, 1980), 33–34. Illustrated Sydney News, 10 August 1878, 7. Illustrated Sydney News, 3 Jan 1891, 10–12. Table Talk, 10 December 1897, 9; Medor, Central Register of Male Prisoners, No. 28816. A description of Medor’s stall and business practice appears in ‘A Melbourne Nostradamus’, Table Talk, 10 December 1897, 9. The title ‘Sidereal Scientist’ appears throughout the reportage. See, for example: Age, 11 April 1899, 5. Weekly Times, 15 April 1899, 17. Ibid; Age, 11 April 1899, 5; Weekly Times, 22 April 1899, 12. Letter from Medor to Captain Evans (Inspector General of Penal Establishments) and Lieutenant Governor John Madden, Medor trial briefs; Age, 11 April 1899, 4. Yea Chronicle, 4 May 1899, 2. Testimony of Dr Robert A Stirling, Medor trial briefs. See: Alana Jayne Piper, ‘A menace and an evil’, Fortune-telling in Australia, 1900–1918, History Australia, 11, no. 3 (2014): 53–73. Correspondence from Inspector of Markets (7 April 1899), and formal notice from Town Clerk (8 April 1899), Town Clerk’s Files – Markets, Box 565. Alcoholic withdrawal became one of the leading explanations for Medor’s state of mind during the murder trial (Testimony of Dr Francis Morton, Medor trial briefs). Testimony of Annie Cartwright, Medor trial briefs. Postmortem report of Dr John Brett, Medor trial briefs. Testimony of Barnet Freedman, Medor trial briefs; Age, 12 April 1899, 7. Medical reports of Drs Stirling and Morton, Medor trial briefs. Medor, Central Register of Male Prisoners, No. 28816. Undated manuscript copy of letter to Frederick Kettle Senior, Medor trial briefs. Crookwell Gazette, 30 October 1900, 2; Geelong Advertiser, 16 February 1904, 3. Argus, 25 August 1908, 4. Age, 20 May 1909, 5. William Adeney, Diary, 1842-43. MS 8520A, State Library of Victoria. Jean F. Field, And so today…a picturesque cavalcade of the years between (Melbourne: The National Press Pty Ltd, 1956), p. 11. Tony Dingle, ‘People and places in post-war Melbourne’ in Graeme Davison, Tony Dingle and Seamus O’Hanlon, The cream brick frontier: histories of Australian suburbia (Clayton: Monash Publications in History, 1995), pp. 27-40. And so today, pp. 31-2. And so today, p. 25. Jean F. Field, These joyous sands (Sorrento, 1959), p. 43. Jean Field, Grey ribbon to the border (Melbourne: The Hawthorn Press, 1973), p. 1. Hugh Anderson, ‘Clarke, William John (1805–1874)’, Australian Dictionary of Biography, National Centre of Biography, Australian National University, http://adb.anu.edu.au/biography/clarke-william-john-1902/text2247, published first in hardcopy 1966, accessed online 7 May 2018; Grey ribbon to the border, p. 6. Jean Field, Waggon wheels thro’ the flowers (Melbourne: The Hawthorn Press, 1977), p. 19. West Australian, 27 January 1910, p. 5; West Australian, 27 February 1911, p. 1. The Gisborne Gazette, 6 October 1916, p.2. Bunbury Herald and Blackwood Express, 28 May 1928, p. 3. Camperdown Chronicle, 16 June 1932, p. 5 (http://nla.gov.au/nla.news-article23364013). William Adeney diary, MS 8520A, State Library of Victoria, pp. 307, 309. And so today, p. 15. Grey ribbon to the border, p. 59. These joyous sands, p. 77. Henry’s going to start us off with an aural postcard that should get our ears ringing. I’m going to introduce you to a fascinating set of photographs of Melbourne from the 1950s and 60s. And Helen and Nikki will tell us about a case of sleepwalking with tragic consequences. I’m Henry Reese and this is ‘Aural Postcards,’ a podcast segment that listens in closely to the sounds of our city. Join me as we explore Melbourne through our ears and unravel some of the rich tapestry of sound that shapes city life. To kick things off, today we’ll be talking about bells, of all shapes and sizes. I’ve been thinking a lot, recently, about the bells of Melbourne. I live in Coburg and every morning I awaken to the sound of the bell of St Patrick’s Catholic church ringing out above the rumbling traffic of Sydney Road, the clangour of the Number 19 tram as it passes every eight minutes, and the shouts and chatter of children walking to school. As a historian writing about the history of sound, I think it’s great that my ears awaken me in this way. The busy city provides its own kind of urban dawn chorus. I’m not quite as enthusiastic about the hoons whose burnouts keep me awake at night, though. Now the humble bell of St Patrick’s has been tolling ever since 1888, and it provides the soundtrack to my daily studies. Every hour it rings out, reminding me that time has a way of spooling away from us, of shrugging out of our grip, no matter how tight. Us historians are acutely aware of this. But recently this bell got me thinking: what other bell stories might there be out there? What other relationships with these strange resonant heavy bronze objects might Melburnians have formed over time? For while the city changes around them, old bells have a stubborn tendency to stay the same, doggedly ringing out the same notes as they always have, even if they’re drowned out by growing urban noise as it rises like a tide of sound around them. While a lot of other colonial voices have long since gone silent, the bells of Melbourne ring out still, putting us in touch with the possibility of a long-lost sound-world, just out of reach. The sound of a bell has meant different things to different people in different times. Bells, for instance, can be a tool of authority. For convicts, prisoners, soldiers, sailors, schoolchildren and Aboriginal people confined to European missions, bells have long been used to impose discipline, routine and efficiency. Can you imagine going to school without bells? I know I can’t. The ringing of a bell is a symbol of civic order, it marks out the hours of the day — the modern world is one that is lived by the clock, and bells have provided an audible marker of this time regime. Historian Graeme Davison has argued that, in the colonial era, bells were the ‘metronome[s] of the local community’. Indeed, public clock towers and bells were a feature of the colonial urban landscape from the foundation of European settlement onwards. I’m sure you can think of some fine examples of this kind of architecture from a church or town hall in your own suburb or community. The tragic glass cathedral of Peter Carey’s brilliant novel Oscar and Lucinda always springs to my mind. The early governors of New South Wales and Victoria placed a high premium on bells and clock towers. They saw punctuality as a modern, efficient, public good, necessary to impose from without. Everyone was to live by the clock and its bronze cousin, the bell. By the 1850s gold rush era, however, public bells and clocks were less of a priority for urban planners and architects. They were already ubiquitous in the landscape. By the end of the nineteenth century, some even felt that church bells were becoming increasingly irrelevant in the modern world. The Melbourne journalist and urban explorer John Stanley James, otherwise known as the ‘Vagabond,’ was one such voice. As he wrote in 1884, ‘In this country where everyman has a watch and every house 2 or 3 clocks, I think church bells should not be allowed, unless musical’. But still these signals continued to matter for a long time. As late as 1915, a Melbourne workingman wrote to the City’s Town Clerk, complaining that the Town Hall clock was always a little bit behind time. The problem was, his employers marked time using the Town Hall’s clock. To this man’s annoyance, when his foreman rang the six o’clock bell to dismiss the workers at the end of the workday, he would routinely run late for his train. The railway’s time was more punctual than that of his factory. When bells and clocks fell out of sync like this, all sorts of social order could break down. Bells, then, can also be symbols of disorder, of private activities, of the hum and buzz of street life. In fact, the clang of the auctioneer’s handbell was ubiquitous in boom-time Melbourne, when land-hungry settlers jostled for a slice of the new city to call their own. Hawkers and door-to-door salespeople rang bells to advertise their goods, trying to make themselves impossible to ignore on the street. Bullock teams clanged furiously as they dragged drays of goods to port or market. City bellmen — such as Sullivan, who plied his ancient trade on horseback through the Hoddle Grid — rang and roared the news, advertisements and other announcements throughout the city streets. ‘Hear ye, hear ye’ means just that – an injunction to listen in. In 1845, the City Council even passed a by-law regulating the ringing of bells on the streets, and routinely declined citizens’ applications to act as official Council bellmen from the 1860s through to the 1910s. There were too many bells on the streets already, the town clerk thought. So, if you close your eyes and imagine yourself back on Melbourne’s streets — especially from the mid-1880s or after, when trams with their own iconic bells started to fill the landscape — you are imagining a world where bells rule, where the variety of signals that they transmit were intimately understood by citizens navigating the streetscape. These sounds were civic, commercial, informative, devotional, for entertainment or transport or warning. And these signals spread far and wide. 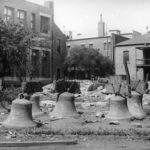 In the booming 1870s, when the eight new bells of St Patrick’s cathedral in Fitzroy rang out, they could be heard from as far away as Heidelberg, miles away, out on the bush fringe far to the north-east. You could stop up your ears, perhaps, but you could not escape the sound of bells in the Melbourne environment. These eight bells at St Patrick’s had undertaken a remarkable journey to get to Melbourne. They were hung in the new belfry of the cathedral in 1868, but their journey goes back much further than this. Church bells are heavy, expensive and rare. They’re not easy to come by. They require great expertise and cost to cast, transport and install, and their biographies, their movements around the British Empire and the world are even more fascinating for this; they can help us to map the global cross-currents and flows of commodities and lives that came together in Melbourne. The St Patrick’s bells began their life in the Murphy foundry in Dublin in 1851. They were put on display in the Crystal Palace in London, at the famous Great Exhibition, that iconic celebration of British industrialisation and imperialism. It was here that Bishop Goold, the foundation Catholic Bishop of Melbourne, first saw and heard these bells on a trip to Europe. He was impressed. Goold had only been residing in Melbourne for three years by this time, and plans were afoot to build a cathedral to minister to the city’s growing population of Catholics in the gold-rush period. Bishop Goold bought these bells for the kingly sum of £500 and had them shipped back to Melbourne, where they arrived in February 1853. 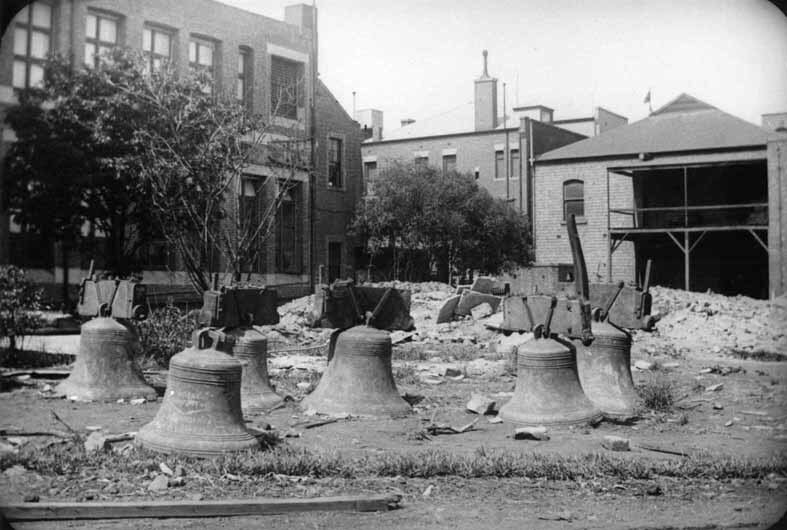 Unfortunately, there was no bell tower to house them as yet, so for eight years they sat on the porch of St Francis’ church on the corner of Elizabeth and Lonsdale Streets, at the mercy of the elements. They were eventually hung and baptised in the south-eastern tower of the Cathedral in 1868, when their sound first radiated out to the hills of distant Heidelberg. There is also a long tradition of Protestant bell-ringing in Melbourne. In 1848, the humble St James’ church, on the corner of William and Little Collins Streets, was named the first Anglican Cathedral of the city. It needed six bells to summon the faithful. These arrived in 1852 and they also had an interesting journey; they were cast at the bell foundry of Mears & Stainbank, in Whitechapel. This storied old foundry had supplied many famous bells throughout the world. In their 1885 catalogue, the foundry staff boast of their world-wide trade. In addition to Melbourne and throughout Britain, they had supplied peals of bells to cathedrals across India, Hong Kong, South Africa, Jamaica, Trinidad and Canada. Their Australian clients also included congregations in Sydney, Hobart, Geelong, Ballarat and Sandhurst. Mears & Stainbank were responsible for distributing a very particular type of religious sound throughout the British Empire. And summon all to pray. The six bells of St James’ had a long and illustrious career. They rang for eight days straight in 1863 to celebrate the Prince of Wales’ wedding. They were also muffled for more solemn occasions, like for the three-hour funeral procession for Burke and Wills in 1861. The City Council provided a salary to a team of ringers to ring the bells every Sunday and on important civic occasions such as the Queen’s and Prince of Wales’ Birthdays, Separation Day, Christmas Eve, Christmas Day, New Year’s Eve and New Year’s Day. But they eventually fell out of regular service. In 1913, St James’ was found to be unsafe and it was moved northwest and rebuilt, stone by stone, just off Flagstaff Gardens. An amazing photograph, held by the Royal Historical Society of Victoria, shows the six bells sitting forlorn on the site of the demolished church, ready to be moved on. By the late nineteenth century, the bells of St. James’ were also overshadowed by William Butterfield’s gothic cathedral of St Paul’s on Flinders Street, which was consecrated in 1891. Henceforth, St James’ was known as the Old Cathedral. St Paul’s had a grand thirteen bells, weighing in at over 7 tons and also cast in the Whitechapel foundry. They were first rung in November 1889. At his New Year’s Day service at St Paul’s in 1890, Bishop Field Flowers Goe waxed lyrical about the importance of bells in colonial society. He stated that ‘bells mingled themselves with all the greatest and the most important events of life from the cradle to the grave’. By now, talk of Federation was in the air, and the Bishop claimed that civic ceremonies, led by bells, ‘tended in a measure to bring about what, as patriotic citizens, they desired to witness — Australian Federation’. These three cathedrals still boast the most renowned collections of bells in Melbourne, but there are many other examples of the function of bells in public life still. One of my favourites is the Federation Bells, an installation of 39 bells that opened at Birrarung Marr in 2001. The public are invited to compose for this contemplative, beautiful, gamelan-like instrument, with composing software that is freely available online. I encourage you to check it out. But there is perhaps one bell that is more famous than all others in Melbourne. This is the bell of the ship Lysander, whose remarkable story joins Victoria’s colonial and convict pasts to our present-day passion for the great game of Australian Rules Footy. Thankfully today Roland Wettenhall – an expert in the prison hulks of Port Phillip – is here to give us a sense of the biography of this fascinating bell. Roly, take it away. Thanks Henry. As all Melburnians know, Australian Rules Football is one of the great sporting institutions of the city. Towards the end of the game, the supporters may be desperately crying out ‘ring the bell’, ‘ring the bell’. At the Melbourne Cricket Ground, the spiritual home of Australian Rules, a bell has not been heard for over 60 years. Only long-standing supporters will remember when a bell was last used – it was a ship’s bell affectionately known as ‘Old Lysander’. Old Lysander rang out over the MCG for thirty years. But before its life at the ‘G – as Melburnians love to call the ground – the pealing of the bell attracted the attention of the citizens in other exciting ways after its arrival in Port Phillip Bay in 1850. Old Lysander was the ship’s bell on the vessel, Lysander, an East Indiaman built in Scotland. The Lysander travelled from British ports to Adelaide and Melbourne in the 1830s to the 1850s. Her most famous voyage was that which took her to Melbourne via Adelaide in November 1850. Having picked up the newspapers in Adelaide, the Lysander entered Port Phillip Bay heads on 11 November 1850 carrying the news of what the newspapers of the day called ‘the Separation rejoicings’. This was news telling of the separation of the Port Phillip District from New South Wales. The accounts of the celebrations tell of the Lysander bell being rung as the ship arrived – news that set off four days of holidays, bonfires across the district, a grand celebration and other celebrations in towns across Victoria. The Lysander was to make one more voyage from England to Melbourne in 1851 by which time the town was gripped by gold fever, with crews deserting their ships for the goldfields, and vessels lying idle in Hobson’s Bay. The owners, with nowhere to sail, sold the Lysander to the Victorian government that initially used her as a hospital ship, but proclaimed her as a prison ship in 1854. Painted yellow and known as a prison hulk, the Lysander was moored off Williamstown with four other prison hulks, all painted yellow. The Lysander’s ship bell would have sounded the watches and served as an alarm when disturbances or attempted escapes occurred – and the escapes did occur. When the vessel was decommissioned, the bell was transferred to the bluestone-built Pentridge Prison, which was being remodelled in the early 1860s, where it continued to be used as an alarm when the prisoners rioted or attempted to make their escape. The Old Lysander’s next life came when it was transferred to the Coburg Fire Station, just around the corner from Pentridge, where it continued to be the community’s alarm for action. After a short stint at the Richmond Fire Brigade, the Fire Brigades Board eventually presented it to the Melbourne Cricket Club in 1922. Hanging on a metal frame and being rung by William Spry – the timekeeper from the 1920s to the end of the Second World War – Old Lysander would have had the ringer as nervous as the supporters, shouting at the players. In 1925, the Sporting Globe reported on the complaint of players and umpires not being able to hear bells at football matches. There were no such problems at the ‘G. Under the heading ‘The bell at the Melbourne Cricket Ground that everyone can hear’, the reporter enthused that Old Lysander ‘can be heard all over the ground and beyond it’. In a thrilling game in 1936, the Age newspaper reported that ‘Saturday’s 54,000-person crowd was in a ferment five minutes before the famous Old Lysander bell brought the thrilling quarter to a close’. By the way, the mighty Demons beat Carlton in that game, with the reporter excitedly telling the reader that the Carlton president was ‘so beside himself that he almost burst into tears’. Such was the power of the bell. Two decades later, the re-modelling of the MCG for the 1956 Olympic Games brought with it a new-fangled replacement – a siren. Old Lysander’s active life was over. She now hangs proudly in the Melbourne Cricket Club museum, silent, brass shining, Lysander 1835 proudly stamped on her side, largely forgotten but always ready to step back into action if needed. Thank you, Roland, for that thrilling journey you’ve just taken us on. So, as we’ve heard, the sound of bells has pervaded almost every aspect of Melbourne life, from worship and work, to education and incarceration, across and between communities, from Separation to Federation, and beyond. A curtain of bronze sound hangs over this old city, and I think it’s worth paying attention to it. Now the conversation doesn’t have to end here. We’d love to hear from you. Do you have any bell stories you’d like to share? Are you a bell ringer? Does anyone know any of the old ringers at the ‘G? Or which stand Old Lysander used to sit on? Please also check out some documents, images and suggestions for further reading on our website, at mymarvellousmelbourne.net.au. Until next time, keep your ears open. It’s kind of easy to lose count isn’t it, in an everyday way, not to notice the slow, daily accretion of new things? Until one day, you chance upon an electric typewriter with a one-line memory in a box in your shed, or an old mobile phone the size of a small brick in a bottom drawer, or any of those obsolete appliances with no cords to plug them in with any more, that once were small miracles, but now are just old junk. And you realise, how much technology has changed. And you wonder, how much have our lives changed, for better or for worse? Technology is all about remembering, and forgetting. It takes us backwards in time, as well as forwards. My teenage daughter asked me, but how does a record player even work? How do you know where to start the track? I once spoke to a man who remembered the first time he saw a motor car, and the first time he came home to find the first electric light. Can you imagine that? Life changing, city changing technology. The first time you see it, you marvel to yourself, how does that actually work without a horse to pull it? How does that light stay on, with no flame? I was 23, Evan Luly was 90. It was October 1985. He was the father of one of my mother’s good friends and work colleagues, Lexie. Born in Preston in 1895, Evan went to Tyler Street State School from 1901 to 1907, then the scholarship class at Fairfield State School, winning a half scholarship to Wesley College. When Pitt became war minister, what reforms did he carry out? How do you find the north or south pole of a magnet? What is meant by political equality? What is a monsoon and state two causes? A train leaves London at 10 a.m., reaching Portsmouth at 1:15 p.m. And another train leaves Portsmouth at 6:15 a.m., reaching London at 11:30 a.m. At what time do they meet? But with all this curiosity and knowledge, Adamson of Wesley, the headmaster – the first person to import an aeroplane into Australia a year or two before – advised against his going on to University on the grounds of his health. So, Evan Luly entered the State Public Service as a Clerk 5th Class, rose to be Chief Clerk of the Lands Department, lived a long and healthy life in fact, retiring in 1960. The first point we noticed was a flood-plain which had been built up by a little stream, which ran at the foot of a small hill … We then took notice of the different speeds at which a river travels as it goes around a bend or curve…We then examined the railway cutting. On one side the rocks were hard and of a dark colour and in the darkness of these rocks we found fossils of shells. Evan: I found one down the street; a car broken down and I’d want to have a look at it. First cars I saw. Lexie: We didn’t get a car ‘till the 30s sometime. Evan: High Street and Regent street; the shopping centre there. Evan: And the other shopping centre was right down to South Preston. And a few shops – two storey places – where the post office is, opposite where the post office is now. Lexie: Yes. And Mister Harvey used to come round the horse and cart and deliver the groceries. Evan: When we started – when I was in Spring Street – there were no lights at all. Then they put a lamp in – a kero lamp; Murray Road, Regent Street, and one in the middle. And the chap had to come round and light it. That went on for a while. Then they put the gas up the streets, ‘course they had a gas lamp down at Murray Road, gas lamp at Regent street, and a gas lamp in the middle. Then we got gas put into the house. Then we got electricity round there, and I came home one day, and we had an electric light! Be after the First World War 14-18; that’s when Preston started to grow a bit. And after the Second World War, the place went whoosh! Buildings went up everywhere! Evan: I was on the Inquiry before that, as to what to do with the land when the asylum was moved. And I was appointed secretary to it, and I went over the Chief Secretary’s Department ‘cause I was like: ‘What have I got to do?’ And they told me they would soon be up to it, you see? So, we started off, and we made the inquiry, and we made the decision it should be made into parkland. And that was it. And then after a while, they wondered what to do with the place, had Whelan the Wrecker in there for years, taking the old buildings down. And the last building to go was a two-storey building, bluestone, where the head of the asylum lived. So, then they made me Secretary of this committee, and I used to spend a lot of time out there, and I wondered, the department allowed me to do what I did do. I had the brain wave to make a public golf course there. I got the idea from a public golf course in Adelaide. And forced them to make the golf course out at Yarra Bend, was bluestone. We couldn’t even use a tractor to try and plough it. So they had to put soil on top. And they started off with nine holes. And the first year we opened the nine-hole golf course, I reckon we got £1,600, then we got about £1,700. And that started the ball rolling. And after a while they made another nine holes, and they wanted to put a too-complicated hole, and I said ‘no, you can’t do it —they’ll be hitting it into the Yarra’. Lexie: In La Trobe Library in the City, they’ve got a photo album of all the photographs taken – he took – before it became a golf course, and a park, and so on. And you know, looking up there and saying, ‘this is going to the ninth green, and tee, and whatnot’, is all documented in photographs. Including the ribbon used for the opening of the Kane Bridge, which used to have his name up. Lexie was a great traveller, an art teacher with an eye for texture and form and colour; in the 1950s she started teaching out at PLC in Burwood, driving from Preston down Manningham Road at eight o’clock in the morning, and only passing three or four cars between Heidelberg and Doncaster, watching Melbourne’s post-war suburban spread unfold over the undulating terrain of the south-east. And they were keen photographers – in an era long before mobile phones had us drowning in pictures – the Lulys selectively and systematically recorded the urban landscape of a Melbourne in transition, bluestone and cast iron lacework, spire and chimney, but also concrete slab and curtain wall; other things that now seem old and established to us, just part of the furniture, were once – to their mind – brand spanking new and novel. Flinders Street Station crowned with red white and blue bunting for the royal visit in 1954. The former ICI house in Nicholson Street during construction in December 1957, its glazed curtain wall architecture half finished, breaking Melbourne’s old 132-foot height limit. The Olympic Games Pool being built in 1956. The marvel of the new Sidney Myer Music Bowl. The modern architecture of suburban churches: St Benedict’s in Burwood, 1959; the Methodist Church in Reservoir, 1961. The first goods train ‘straight thru’ from Sydney in 1962. An aerial view from the National Mutual Building looking south-east over Melbourne in 1965, the old Allen’s sweets factory dominating the southbank skyline. The arrival of the first TAA 727 jet in 1965. Old bluestone warehouses in Robbs Lane. The West Gate Bridge still under construction and the opening of the Tullamarine Freeway in 1970. The Federal Hotel in the year that grand old Coffee Palace was demolished, in 1972. The old Travellers Hotel opposite the State Library on the corner of Swanston and La Trobe Streets — demolished in 1973 for the underground station. Coops Shot Tower in Knox Street, 1974, before it was encased in its cone. Jonah’s Fruit Shop at 89 Collins Street, opened in the 1930s between the Melbourne Mansions and the Athenaeum Club, renowned for its magnificent window displays of fruit and its novel gift baskets made up especially for ships and hospitals. The Bourke Street Mall just closed off to traffic in a trial around 1974. And there are classics of course – the National Art Gallery and Museum, the Windsor, Princess Theatre, Vic market sheds in Peel Street, the Royal Botanic Gardens, the Yarra River. I dropped in to see Lexie the other day – a sprightly 94-year-old – older than her father was when I spoke to him in their back garden in Preston in 1985. One evening, just a fortnight after we all had sat around yarning, as the days lengthened towards summer between that sunny October afternoon and the close of the year, she had called her father in for tea. When he didn’t reply, she went outside to find him slumped over his broad beans, secateurs in hand. A final act of tending the landscape, at the very end of his days. But there’s his voice, and some of his photos, and his love of Melbourne – that celebrated it, marvelled at it, but also played a small part in creating it. Welcome to the first My Marvellous Melbourne ‘On the Beat’ segment. Given the nature of the content, I’m not sure that the moniker Marvellous really applies here, although we do reveal a first – in case law at least, if not in sadness. I’m Helen Morgan, an archivist and historian of Australian women; with me is Dr Nikki Henningham, also an historian of Australian women and an oral historian who does life history interviews for the National Library of Australia. Ok, so this is a story of discovery, one that began over an ordinary family dinner and which revealed a family connection to an Australian legal precedent. Thursday night is roast dinner night at my mother-in-law’s house. Three generations of us gather around Norma’s table to enjoy her excellent roasts and puddings. While she holds us captive with her cooking, she slips in the odd story of life ‘back in the day’; back in Melbourne, where she has lived for all her 85 years. Generally, these tales have the capacity to clear the room of grand children of all ages, who offer to clear the table and clean the dishes rather than listen to stories of the doctors of Collins Street, or whatever Norma’s antiquarian obsession of the week might be. One night, one of the kids decided to guide her onto her more entertaining topics. ‘Nanny, tell us more about your courting days with Pa’, he suggested, knowing that these stories were generally about their late grandpa making a fool of himself at the Ormond Picture Theatre or the Australia Hotel. Tonight, however, we were treated to something unexpected. 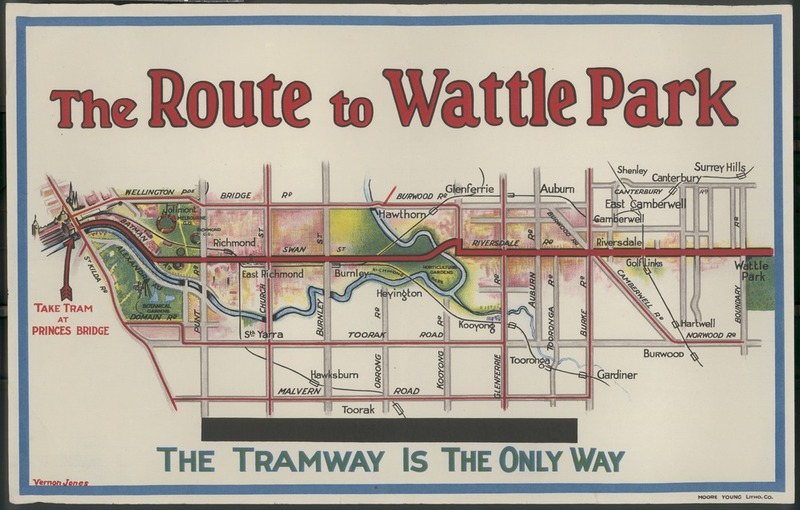 As we waited for the dinner to be dished up, she began: ‘Well now, early on in our courting, we were catching the tram back to Carnegie when your grandfather, the old romantic, pointed out a house and said, “Now that’s an interesting place! That’s where Dulcie’s sister murdered her daughter with an axe”’ . Nothing grabs attention like a tale of true crime in the suburbs! ‘Why haven’t we heard about this before?’ we asked. ‘This can’t be true – Ma, stop exaggerating, stop making things up’. That was the immediate response from all of us — we assumed that there was some dramatic license being taken with this tall tale! Immediately, I went to the google machine on my phone, and entered ‘Oakleigh Road, axe murder, 1950’ (we figured that if it was early in their courting days it had to be around then). We had no names except Dulcie – whose surname was unknown. The google machine revealed nothing. I then went to the National Library of Australia’s digitised newspaper collection, entered the same search terms and, lo and behold, up came dozens of stories providing details that went on to prove that Norma was not making things up. On the night of August 11, 1950, Ivy Cogdon – aged 50 – killed her nineteen-year-old daughter, Patricia, with an axe while she was sleeping. The crime was reported to the police by Florence (Dulcie’s real name) and Sid Miller, who lived next door. Now that I had basic details, I went back to Google and discovered an article in the New Yorker written by a journalist who, in his opening paragraph, refers to learning about the case of Ivy Cogdon from Australia when he was a law student in the 1970s. A variety of other true crime websites and books also mentioned her. Ivy Cogdon, a fifty-year-old housewife from Carnegie, Melbourne, was internationally notorious. Subsequent investigations could find no motive to support a conviction of first degree murder. There was no tension between Patricia and her mother, beyond normal squabbles. Ivy was devoted to her daughter; arguably she was over protective. Most recently, she had been worried about Patricia’s decision to join the army as a driver. Australia had committed troops to the conflict in Korea a bit over two weeks earlier, on July 26, and Patricia saw an opportunity for work that she thought might be glamorous. Ivy, having lost a brother and nephew in the Second World War, was fearful of what this new war might bring, but Patricia probably saw it as an opportunity to get away from her cloistered life in the Melbourne suburbs, and she was ‘always talking about what she would do when the war came’. Dulcie said her sister was very, very worried. ‘Won’t it be awful if the girls have to go to this one?’, apparently she said over and over again. Apparently, Ivy was known for her awful nightmares. Only a fortnight earlier, Patricia woke to find her mother brushing her face with her hand. At the time, she explained it away as ‘just tucking her into bed’, but later, she told an examining psychiatrist that she thought her daughter was covered in redback spiders, after having a dream that a swarm of them had infested her house. Another night, she was found outside watering the garden, after she had turned on all the gas jets in the house. She didn’t know why. During the trial, evidence revealed that she’d had over twenty of these ‘turns’. She’d had nightmares where ghosts appeared at the door, and that she had developed real fear and terror. When she walked in her sleep, she had no idea what she was doing and where she was going. Given her mental illness, psychiatrists thought that not only would it be reasonable for Ivy to have had the dream that led to her daughter’s death, they would have ‘expected it’. She ‘would take every step she could to protect her daughter from violation or pollution’. It didn’t take long for a jury to acquit Ivy Cogdon, making her the first person in ‘the English-speaking world’ to successfully use the defence that she was sleep-walking at the time. A handful of cases worldwide have successfully been run using somnambulism as a defence, but Ivy was the first ever sleep-walker in Australia to be acquitted of murder. She was not set free, however; Ivy was sent straight to Mont Park Asylum, where she died in 1952. Her tragedy, nevertheless, lives on in legal textbooks used by leading law schools. Now this is where what I know happened ends and speculation begins. Leaving to one side the historical context that narrates the treatment of people with mental health issues in mid-twentieth century Australia, and the way gender intersects with that, how would someone with some sort of psychotic disorder and severe anxiety, process what was happening in 1950s Melbourne, in the grip of the cold war? Historical material shows how fearful Australians were of ‘reds under the beds’, of the ‘advancing, rapacious yellow hordes’, of what would happen if war came to Australia again. Propaganda, in the form of posters, newspaper articles, newsreels and more, was all around us, fuelling that fear. Australia had just committed troops; Patricia was anxious to get involved. Ivy and Patricia had just been to the movies; perhaps they’d seen a newsreel that noisily proclaimed the danger Australia was in. Maybe she went to the bed in a heightened state of anxiety? So, I am, personally, really interested in using this case study as a way of teasing out the historical dimensions associated with the use of propaganda to create enemies, and the human cost involved in manipulating people who, for whatever reason, do not have the capacity to resist it. It remains as relevant today as it ever has been. And if it hadn’t been for the serendipitous conversation over dinner, and the immediate feedback mechanism that is Trove, I wouldn’t be talking about it as a case study with you now. Thanks Nikki. I have inklings of what it must have been like to be alive during the Cold War in Melbourne through fiction, such as Nevil Shute’s On the Beach, but this really brings it home. It makes me want to talk to my older relatives and find out how they experienced this period in Melbourne. It’s a real eye opener. I’d like to finish now with some quiet reflection in memory of Ivy and Patricia Cogdon. Graeme Davison, The Unforgiving Minute: How Australia Learned to Tell the Time (Melbourne: Oxford University Press, 1993), 33. Andrew May, Melbourne Street Life (Melbourne: Australian Scholarly, 2017), 107. Helen Pettet and Anne Doggett, The Bells Are Ringing! A Celebration of Melbourne Life through the Story of Her Bells (Melbourne: Helen Pettet & Anne Doggett, 2001), 11. Whitechapel Bell Foundry, Catalogue of Peals and Bells from the Foundry (London: Mears & Stainbank, 1885), 8–13, 41–44. Pettet and Doggett, The Bells Are Ringing!, 4. The architect was William ‘Butterfield’, not ‘Butterworth’.